We are leading Slipring Collector Columns, manufacturers, suppliers and exporters located in Ambarnath MIDC Dist Thane, Maharshtra India. Mitool Slipring Collector columns are designed to collect and transfer a multitude of power and control supply functions from stationery to rotating or oscillating equipments. 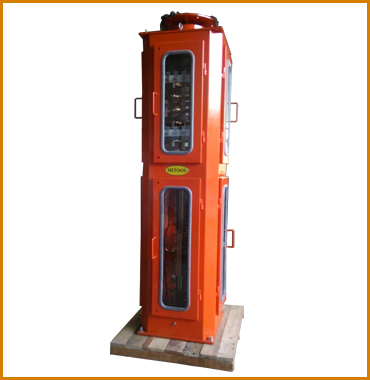 Mitool provides a comprehensive range of slipring collector columns from 30 A to 600 A & voltage 500 V to 12 kV with its enclosure as per customer requirements. Control sliprings can also be silver or gold plated with silver graphite brushes used, for example in telecom circuit and PLCs. Enclosures are fabricated from Aluminium or M.S.Sheet and then painted or powder coated. Mitool slipring collector columns are built to suit weatherproof units with easily removable covers for inspection and maintenance. Mitool slipring collector columns are designed to be continuously rated with minimum of two brushes on each slipring and meet the requirement of all current international standards. Mitool Slipring assemblies is made of phosphorus bronze or brass with suitable insulator between each ring. Each ring is fitted with at least two copper graphite brushes held in contact by self adjusting, spring loaded caliper type brush holders, which ensure positive contact at all times. Where low contact resistance and low noise levels are required, silver plated rings can be supplied up to 40 microns thickness together with sliver graphite brushes. Mitool slipring assemblies range available are from 30 Amps to 600 Amps and voltage range from 500 V to 12 Kv. A simple peg with adequate clearance should be used to rotate housing via the drive connection. Power feed to housing should be via cable. Construction â€“ All steel components are zinc plated and yellow chromate passivated. Enclosures are fabricated from Aluminium or M.S. Sheet and then Painted or Powder Coated. Available with either top or bottom cable entry. Mounting Flanges are manufactured in Mild Steel plates. All external fasteners are used of Mild Steel / Stainless steel. Rotates on low friction, sealed for life ball bearing. Removable cover for easy inspection.